Since margarine came on the scene, butter lovers have been crying foul. Yet margarine is more abundant in the dairy aisle of most grocery stores. Both butter and margarine have pros and cons, but there are distinct differences. Butter and margarine are tasty staples in recipes and at the dinner table, and both come in sticks and tubs. That's pretty much where the similarities end. Despite being used for the same thing, butter and margarine are very different products. One is made with help from nature, the other from chemistry. According to the Perdue.edu, butter is "a concentrated source of milkfat (80%) with some water and nonfat milk solids." It may be salted or unsalted. Butter is made by churning cream until thickened. Before butter production went commercial in the late 1800s, it was hand-churned on farms and in households throughout the country. This was time-consuming and provided limited amounts of butter. Today, most butter is made by a "continuous churn" process which forces pasteurized cream through a filter. Some smaller companies and farms still churn the old-fashioned way in small batches. Traditional butter: This butter is made from pasteurized cream. It is graded based on flavor, body, salt content, and color. The average stick of butter in your supermarket earned the top grade, USDA AA. Lower grades of butter are mainly used in manufacturing. Whipped butter: Whipped butter is made by adding air or nitrogen into regular butter to give it a whipped, dense texture. This makes it more spreadable than traditional butter. Reduced-fat butter: This type of butter contains 40 percent or less milkfat. It's made from nonfat milk instead of cream. Butter can be refrigerated in its wrapper for up to two months. It can also be frozen for several months. Once opened, you should store butter covered in your refrigerator. According to Mental Floss, when margarine was created as a butter substitute, it was made from beef tallow and milk. Today, unlike butter, it is made from a blend of refined vegetable oils. Most refined vegetable oils used to make margarine are extracted using hexane, a chemical solvent. Once the oil is extracted and cleaned, hydrogen gas is added to some forms of margarine. This causes some of the oils to become solid (partial hydrogenation). All types of margarine are bleached and steam-cleaned to remove unwanted colors and odors. Finally, coloring is added to give it a bright yellow hue. Butter seldom has added ingredients other than salt. Margarine may include buttermilk, cream, or olive oil for flavor. Some blends also add cholesterol-lowering plant sterols. Margarine is found in tubs, sticks, and liquid form. Most tub margarines contain 61 to 79 percent vegetable oil. They may also contain some partially-hydrogenated oil, although many are labeled trans-fat free. Since it's solid, most stick margarine contains unhealthy trans-fat. Like butter, margarine freezes well. It may be frozen for up to six months. According to the USDA Nutrient Database, margarine and butter are comparable in fat and calories. A tablespoon of butter contains 100 calories and 11 grams of fat. A tablespoon of stick margarine made from corn and soybean oils has the same. Margarine spread (tub margarine) has 85 calories and 10 grams of fat. Whipped butter has 66 calories and eight grams of fat. The effects of margarine and butter on your health have been on a roller coaster ride. One day they're good for you, the next day they're not. 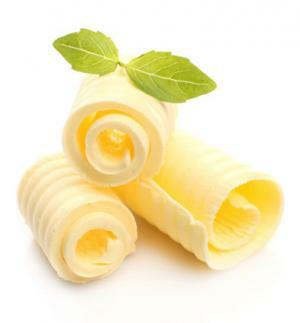 For many years, butter was taboo because of its high saturated fat content. According to the American Heart Association (AHA), saturated fat raises cholesterol and increases your risk of heart attack and stroke. One tablespoon of butter has seven grams of saturated fat. But the saturated fat debate is just getting started. Research is leading scientists to question whether saturated fat is as bad for you as once thought. A 2009 meta analysis published in the American Journal of Clinical Nutrition showed there is no significant evidence that dietary saturated fat increases the risk of cardiovascular disease, coronary disease, and stroke. Butter's saturated fat content made stick margarine a popular butter alternative until researchers discovered trans fat is the enemy too. The AHA states trans fat also raises your risk of heart attack and stroke. It also may increase your risk of type 2 diabetes. Unlike saturated fat, there is no debate that trans fat is unhealthy. Tub and spray margarines are not hydrogenated and contain little to no trans fat. This makes them the healthiest margarine option. Despite positive research on soft margarine's cholesterol-lowering benefits, it's hard to know if the process of creating margarine impacts your health. Margarine also has added preservatives, artificial colorings, and artificial flavorings. Since butter is made from cream, salt, and water and doesn't go through hydrogenation and bleaching or contain artificial ingredients, many people feel it's the better option. Some people may argue butter isn't healthy or natural if the cows that produce the cream it's made of are given antibiotics. You can avoid that concern by purchasing organic butter or grass-fed butter. This may not get rid of all contaminants in your butter associated with dairy cattle, but it helps. Butter naturally contains vitamins A, D, and E. It also contains small amounts of choline and calcium. Depending on the oil blend, margarine may naturally contain vitamin E. Vitamins A and D are sometimes added. Are Butter and Margarine Interchangeable? If you're looking for something to spread on your toast or top your baked potato, both butter and margarine fit the bill. For many recipes, both work well. Sticks of butter or margarine are good for baking. You should only use margarine that has 80 percent vegetable oil. Tub and liquid margarine are not good for baking. Light butter and whipped butter are also not recommended due to their high water content. Some people feel butter adds richer flavor to baked goods than margarine, especially for sugar cookies and shortbread. If your recipe instructs you to add salt, choose unsalted butter. Unlike margarine, butter needs to be softened before adding it to cookie doughs and batters. Otherwise, it's hard to blend with other ingredients. Whether you prefer butter or margarine is a matter of taste. Many people like butter because it's more natural than margarine. Likewise, there's just something comforting about its creamy texture. Butter and margarine work well in most recipes and are comparable in fat and calories. According to the Mayo Clinic, most margarine is healthier than butter. But thanks to the ongoing saturated fat debate, butter is making a comeback. No matter which you prefer, use in moderation to limit fat and calories.